Prof. Han Seung Lee is a professor at School of Architecture and Architectural Engineering, Hanyang University, ERICA Campus, Ansan, South Korea. He got his B.Sc. and M.Sc. degrees from Dept. of Architectural Engineering, Hanyang University, S. Korea in 1990 and 1992, respectively. Then he got his PhD from Dept. of Architecture, Tokyo University in 1997. He focuses his research on Sustainable Building Materials, High Performance Concrete, Durability Design of Structures, and Rehabilitation of Concrete Structures. Prof. Lee has numerous journal and conference papers, and 10 books. Prof. Mohamed A. Ismail is currently a Research Professor at Hanyang University, Erica Campus, Ansan, South Korea. He received his B.Sc. and M.Sc. degrees from Alexandria University, Egypt in 1991 and 1996, respectively and his PhD from Nanyang Technological University, Singapore in 2003. His research work includes Concrete Technology, Smart Materials in Construction, High Performance Concrete, NDT, Sustainable Building Materials and Protection Methods of Reinforced Concrete Structures. He has published more than 60 papers in referred journals and conferences and 5 books. Dr. Sang Hyun Lee got his PhD from School of Architecture and Architectural Engineering, Hanyang University, Ansan, South Korea in 2014. He is currently working as a Senior Researcher at R&D Institute, Lotte E & C, S. Korea. Dr. Lee research interests include Concrete Durability, Concrete Technology, High Performance Concrete, Eco-friendly Materials and Industrial Concrete Floor. Prof. Mohd Warid Hussin is a senior professor at Faculty of Civil Engineering, Universiti Teknologi Malaysia (UTM) in Skudai, Johor, Malaysia. He received his PhD degree from the University of Sheffield, UK in 1985. Prof. Warid is currently a senior research fellow at Construction Research Centre, CRC. He has been involved with research on Fibre Reinforced Composites, Blended Cement Concrete, Aerated Concrete, Concrete Repair Materials, Ferrocement Technology and Geopolymer Concrete and has published more than 200 papers in journals and conferences. Concrete carbonation decreases durability of concrete. 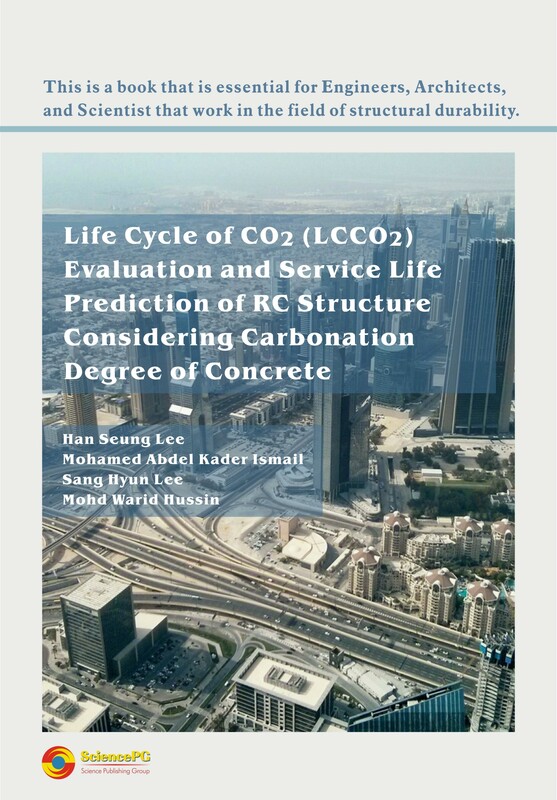 Therefore, quantitative evaluating method for the amount of CO2 absorption through carbonation should be considered under the condition that carbonation does not affect durability of RC structure. This study proposed a quantitative evaluating method that overcomes the limitation of the traditional qualitative evaluation, which is carried out using the naked eye with respect to the color change boundary by spraying indicator. Carbonation depth becomes the basic data for estimating the residual life and durability of RC structures. To achieve this objective, the quantitative change of Ca(OH) 2 and CaCO3 for each depth in concrete according to the carbonation process is measured using TG/DTA in order to propose a quantitative method and an evaluation basis. Another goal is to propose evaluating method of CO2 absorption in the air through carbonation and how to evaluate LCCO2 (emission – absorption of CO2).